Gary's birthday is three days before my own (I turn 50 on the 30th - AARP here I come ;) To be honest, I've done my best NOT to think of birthdays this summer, so I almost missed Gary's this time around. Simply put, much of who I am today is due to what Gary first published in 1974. Without Gary and the hobby that formed around Dungeons & Dragons, I would be a lesser man. Dungeons & Dragons helped spawn friendships that I've maintained since my mid teens - 35 years and counting. No other friendships of mine have lasted as long. The OSR has spawned some of the tightest friendships I have made in my adult life. Scratch that - THE tightest friendships in my adult life. Without Gary and his work, I'd have a much smaller circle of friends. I never would have become a cop without my background in Dungeons & Dragons. Simply put, there were times I had to roleplay being a cop over my 20 year career and it worked amazingly well. My current success, albeit small, as a blogger and occasional content producer I owe to Gary and all those that came after his own success. Gary, I tip my glass to you. You gave me an open invite to game on your porch, and although I was never able to take you up on that offer, just the fact that you made the offer means the world to me. May you rest eternal doing that what you enjoy. Well said. Also, do join AARP.. the savings and deals alone are worth it. 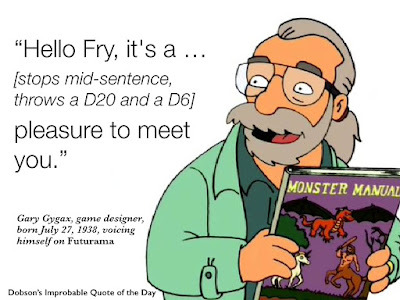 The day Gary Gygax passed, I had the following conversation with my mother. ME: Hey, Gary Gygax died today. MOTHER: (looks suspicious) Who's that? ME: He created Dungeons & Dragons. Where would I be without him? MOTHER:(sighs, and then with a sneer) You might have been normal. Thank you Gary for making me the person I am. I just read this, and it is so similar to what I wrote yesterday. This is what I wrote: Happy Gary Gygax Day! This man is responsible for a majority of the friends I have, for creating in me a love of gaming, and it is because of him that I met my business partner, Harold Johnson, who hired me. I began playing Dungeons & Dragons in 1977, with Christopher Clark, who has remained one of my best friends for the past 40 years. Through Chris's partnership with Gary, I was able to meet this man, and get to know him a little bit. The game that this man created has led me to so much that is good in my life. It is kind of mind boggling really. I agree. My best friends are from gaming. I have the original group from the 80's and then subsequent groups of students I have taught the game to at various times in my ministry. Just did a wedding for one of them this summer. Such an awesome hobby. And while I never played D & D, Dragonquest was the vehicle for making all these good friends and associates over the years. Great post Erik!